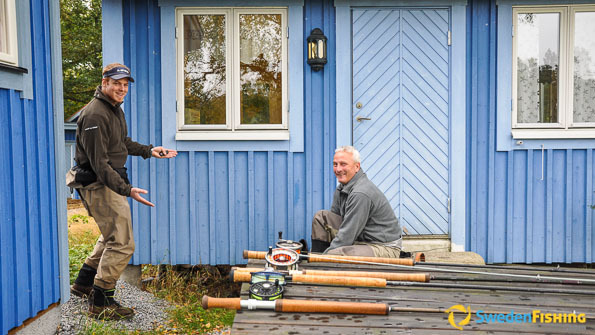 Laxlyckan is your guide and instructor on the Mörrumså River, one of Swedens best known salmon and sea trout waters. We guide you or your whole group through both public and private stretches. We´ve guided satisfied fly and spin fishermen from Sweden and the world since 2004. We also offer appreciated, all-inclusive fishing packages during season peaks. Our fly-fishing courses using double-handed rods include spey and roll casting. At Laxlyckan we speak Swedish, English and some German. 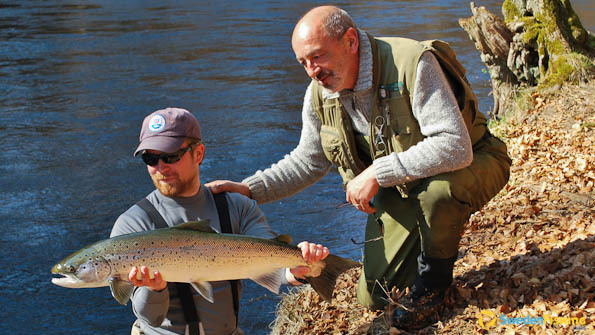 From mid-March to the end of April  mainly fishing spawned sea trout at the usual 3-6 kg weights. May-June  fishing for newly migrated salmon at 8-20 kg. August-September  fishing for newly migrated sea trout and salmon at 3-15 kg. Rainbow fishing in private lake on boats. There is a hunting cabin and a hot tub. Hot and cold bathing huts at Väggabadet in Karlshamn. Wilderness – hike the salmon trail or cycle on the rail embankment trail. Animals/nature – Eriksberg Game Preserve. Riding for children and adults. We suggest fishing stretch, package and program based on your wishes and our experience. River Mörrumsån: Lower: Salmon – 26.72 kg; Sea trout – 18.2 kg (World record!) Upper: Salmon – 12.5 kg; Sea trout – 8.6 kg; Rainbow – 5.2 kg. • Guided tours for groups and individuals. Fishing licence, accommodations and meals are included as wished. • All-inclusive fishing packages at the best season dates. • Fly-fishing course offering professional introduction to the art of fly-fishing. • Sale of equipment and trophy preparation. • A private fishing section of river Mörrumsån. At normal water levels: March-April: Fly rods  13-16´, sinking lines, sinking snoods, 4-2 / 4-8 cm flies. Spin rods  9-10´with 8 kg lines and 15-30 g long, narrow lures. May-June: Fly rods  12-15´, intermediate lines, 8-4 cm flies. Spin rods  9-10´, 8 kg lines with 10-20 g lures. August-September: Fly rods  10-14´, #7-10, floating, intermediate lines, 10-6 cm flies, 5-6 for night fishing. Spin lures  7-15 g/spin flies. While we recommend catch and release fishing, you are allowed to retain two salmon type fishes/day/person, none shorter than 50 cm. In March-April all female salmon are to be released and in September sea trout females as well. We offer different accommodation alternatives for the visiting angler! # Hallandsboda Bed & Breakfast, Knaggelid, Newly renovated 2-4 person cabins with in-house shower/WC. Self-catering, but with final cleaning and breakfast available. Closest fishing – 150 m. # Mörrums Kronolaxfiske, Mörrum, Simpler rooms and cabins next to the classic fishing section, pool 1-32. Closest fishing – 30 m. # Fiskarehuset i Svängsta, Newly renovated villa with 3 single beds, fully equipped kitchen, sauna and drying room. Closest fishing a private section 1-1.6 km (eastern shore). # First hotell Karlshamn and Olofström, Excellent, fully-equipped hotels with good service 10 km from river Mörrumsån. # STF Ebbamåla Bruk, Ebbemåla, Hostel with basic standard, but furnished in a superb early 20th-century style. Closest fishing section – 10 m! # Gamla Gräddmejeriet, Hovmansbygd, Fully-equipped, 1.5-story house with terrace facing the upper river stretches. 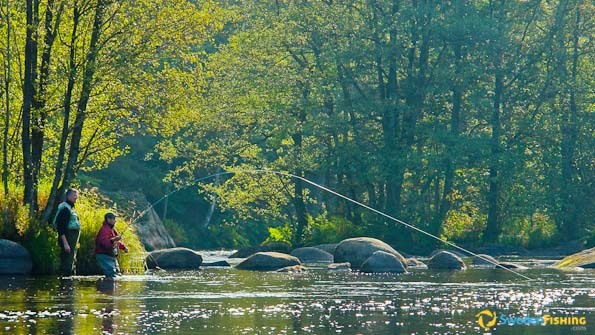 The Mörrumså River in southern Sweden can be fished 50 km upstream as it flows through Blekinge Province. Mörrum is located in SW Blekinge, 10 km west of Karlshamn, 40 km west of Ronneby (domestic air service). Malmö is 160 km southwest and Copenhagen 200 km southwest. The Kastrup airport is 2.5 hours by car.